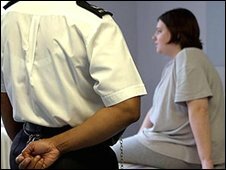 Bullying and theft is rife at a women's prison in north London, an inspector's report has revealed. More than half of all prison inmates felt unsafe at Holloway Prison, inspector Anne Owers has found. Prison managers said the need to improve women's feelings of safety "is recognised and is being acted on". The inspection found levels of "victimisation" by other prisoners was nearly twice as high as at similar prisons, Ms Owers said. Phil Wheatley, director general of the National Offender Management Service, said: "Holloway has now implemented a new violence reduction strategy, produced following consultation with women on safety issues." Ms Owers said: "Our major concern, and that of many of the women we spoke to, was bullying and pilfering on the residential units," she said. "Much of this was low-level, but appeared to be accepted as part of life at Holloway." The report also found high levels of self-harm among the women and criticised a lack of overall strategy for women's prisons and the jailing of women for whom prison was not appropriate. Juliet Lyon, director of the Prison Reform Trust, said: "Once again prison inspectors have found that our overcrowded prisons are holding many mentally ill women who should not be jailed."